I would like to make some more information about the EcoLine. 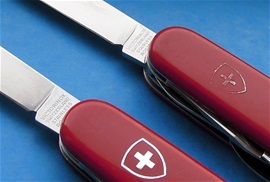 This line or category carries the Officier Suisse tang stamp and the Victorinox Emblem. These two identifies the quality and product. 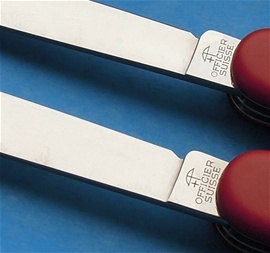 In 1994 Victorinox introduced or decided to use Nylon as the handle material on the EcoLine and this makes the handle material better than the regular line in terms of scratch resistance and it can take impact better than the regular knives. I would believe there are different names for the handle material as well. In general my information is a Nylon material. The precision on the Economy made knives today with springs and parts are just as high as the regular line. The only part I have noticed is the aluminum liner or dividers that may have some less resistance against changes on the aluminum surface. This I have only seen on knives used by others and I suspect it is a maintenance issue because I have never seen any quality problems on the knives I have used. The quality is a “user knife” with quality. I would guess there are some steps in the production and how they are made that are less expensive done. I do not know if the steel grade is less, what i can say is that the functionality and usability is very high. I do not know any knife that can compare to the price VS quality of use. 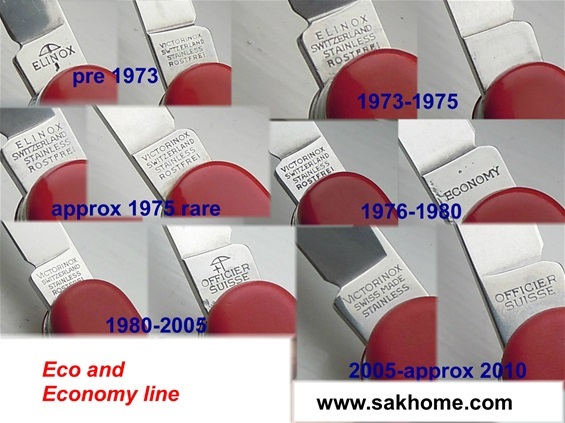 It started with the Elinox knives in 1957, under Economy 1979-1999 and from the year 2000 it was named EcoLine short for Economy Line. I believe they all can be called economy knives. The development of the tang stamps on the economy made knives from 1957 can be seen on the picture below. 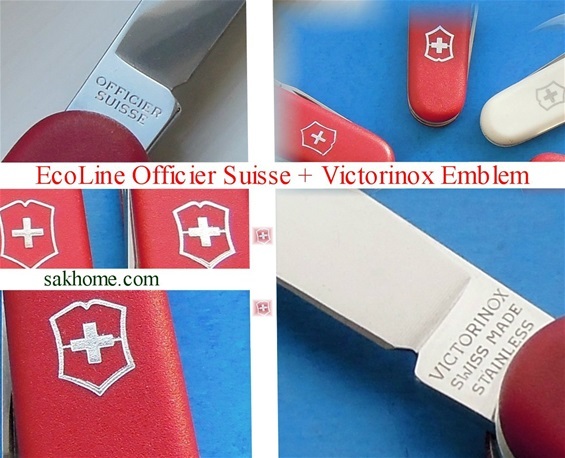 I would also recommend my page about Victorinox stampings for emblems used. 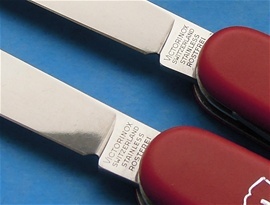 The change from a small v in victorinox to big V in Victorinox must have happened around 1986 on the economy made knife. There are variations on this stamp from 1980 until 2005. This type can be divided into small v 1980-1985 and big V 1986-2005. On the picture to the right you can see the change. On the picture below you can see the backside Officier Suisse and they are similar. Be aware of production variations and evolution. On the main line i have seen alot! Also be aware of the variations on the hot stamp emblem. I suspect there are some related to advertising economy made knives as well. I do not expect my circuit on the right to make any sence. I am researching much on the economy made knives compared to the regular line. If the Elinox 93mm and other Alox categories started up as economy made knives and categories then there is a change from 1975. 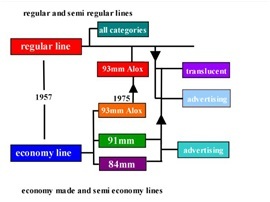 The economy made 91mm and 84mm got a change in 1980. Then there are certain categories and features that i call semi economy made. So far i am keeping this for my self but i do believe some categories from the late 1990s are semi economy made if it is regular or EcoLine. Some are difficult to distinguish and float into each other. Here are some more interesting research on the tang stamps used on the EcoLine 1994-1999. The advantage with these two is that both got advertisings on. I believe these two are close to each other in year.There are obvious differences on the stamp on the main side. This makes me believe the differences may be production variation. Only Victorinox can say for sure. It would be impossible for any foreign manufacturer to copy the Swiss Emblems and tang stamps with success. There are very many small differences and variations not only because of production but also variations made to secure the original product. 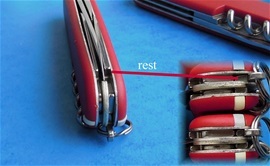 In 1999 Victorinox introduced the notch on the flat screwdriver to prevent accidental closing. Also changes was done to the spring because of this. This is easy to see on the picture on the right. So far i have put this change on the regular line to also follow the EcoLine. 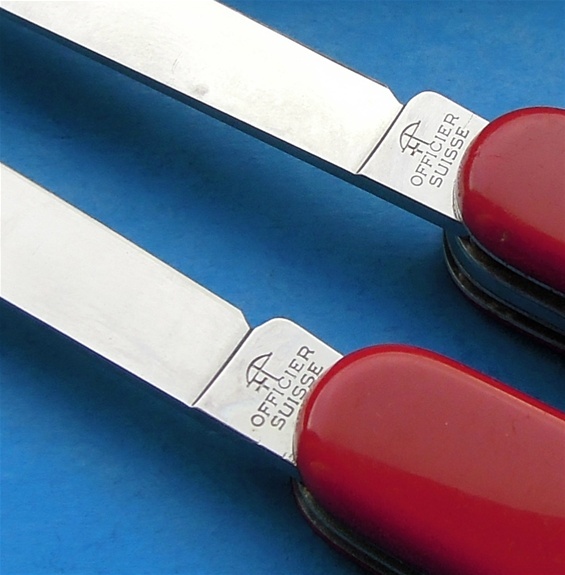 My personal feel is because from 1980 Victorinox stamped the economy made knives with Officier Suisse and this may be because of different reasons. I feel this line got better and better and could be called Officier Suisse knives. From time to time after 1980 the economy knives does not always follow the regular line and advertising knives the same as well. On the picture on the right you can see why the extra lenght on the back of the screwdriver was changed. The notch goes into a counter part in the spring. 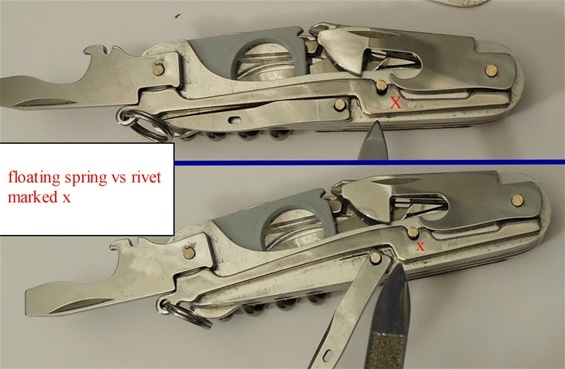 The extra lenght is because of the change on the flat screwdriver design. 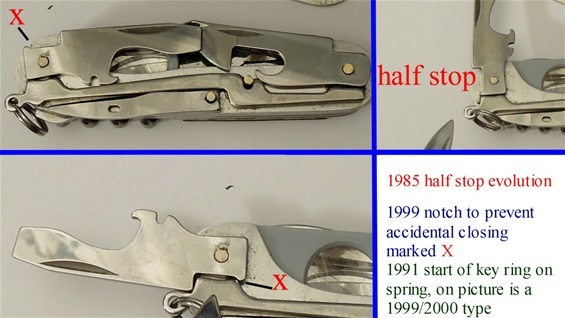 The extra lenght can be used to identify and date a knife. When the screwdriver is fully deployed the notch with counter a part in the spring mechanism. See my guide below. En fin side for å aldersbestemme kniver dette Trond.